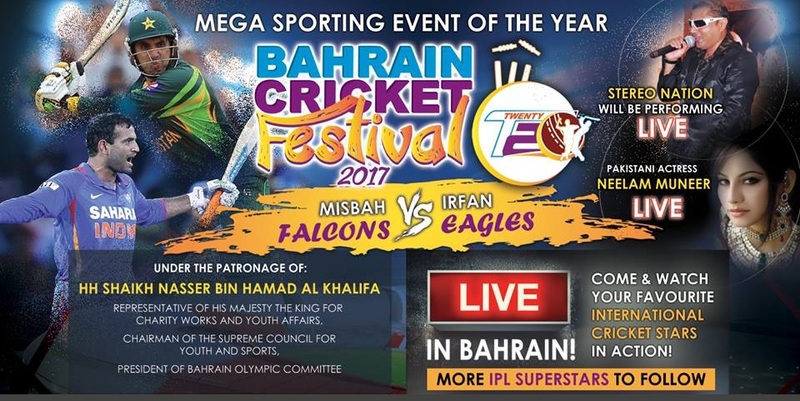 Stay tuned for upcoming events for Bahrain Cricket Festival in near future. Enjoy a fun family Friday with cricket. Local matches, T20 match with international players, live performances, carnival games for kids and families, stage performances, street magic, interaction with international stars/actors and models, bands, and much more. A FULL DAY OF FAMILY FUN! The event is held under the Ministry of Youth and Sport Affairs in collaboration with Bahrain Cricket Academy (BCA) in coordination with Aref Sadeq Design Consultants and Suha Investments and special thanks to His Excellency Mr. Hesham Bin Mohammad Aljowder (Minster of Youth and Sport Affairs) for his support and to Mr. Khalid Saleem Al Haj (Assistant Under Secretary - Sports and Facilities Affairs). VIP & VVIP Tickets: 150 BD and 200 BD. Terms & Conditions : All rights are reserved by organizer for entry into event and venue. Tickets are non-refundable and not exchangeable once purchased. Best Viewed at 1024 x 768 pixels and above. This Page loaded in 0.09163 seconds on Fri, Apr 19, 2019 (07:03).